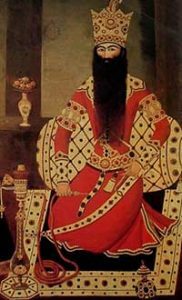 Muhammed Khan Qajar conquered a lot of land for Iran, and made Iran richer. But that didn’t stop him from being killed in 1797, when he was 55 years old. He had ruled for only three years. Muhammed had no kids, but his young nephew Fath-Ali was already the governor of Fars. So he became the next Shah of Iran. Fath-Ali was 25 when he became Shah, and he ruled a long time – until he died at 62 – but nothing went well for him. Russia’s Czar Alexander soon invaded Georgia again, now that Muhammed was dead. By now the Russian army had much better cannons than the Iranian army, and Iran lost a lot of land. Fath-Ali tried to get help from both the British George IV and Napoleon, but neither would help and he had to give up. Fath-Ali also tried to reconquer Afghanistan, but here too he failed. Fath-Ali tried again to invade Russia in the 1820s, and lost even more land. When Fath-Ali died in 1834, his son had already died. So Fath-Ali’s grandson Mohammed took over. Mohammed made an alliance with the French Louis-Philippe against the British Prime Minister Charles Grey to try to reconquer Afghanistan, but he still couldn’t do it. Next Mohammed made an alliance with Russia’s Czar Nicholas, but this didn’t help Iran much either. The main problem was still that the British controlled world trade. Cite this page: Carr, K.E. Iran and British colonialism – the 1800s. Quatr.us Study Guides, September 11, 2017. Web. April 18, 2019.